This butter is super moisturizing and I can feel relief within a minute or two of rubbing it on my skin! The ingredients are simple and effective. *Shea butter is super moisturizing. *Lavender essential oil is antibacterial, anti-inflammatory, calming, and promotes healing. *Cedar wood essential oil helps reduce inflammation, stimulates circulation, and is an antiseptic. Use anywhere you have skin irritations or itchy places. Apply several times a day until its cleared up and then continue with once a day to keep skin soft and nourished. Loved it for my older children who suffer from dry skin! Thank you! 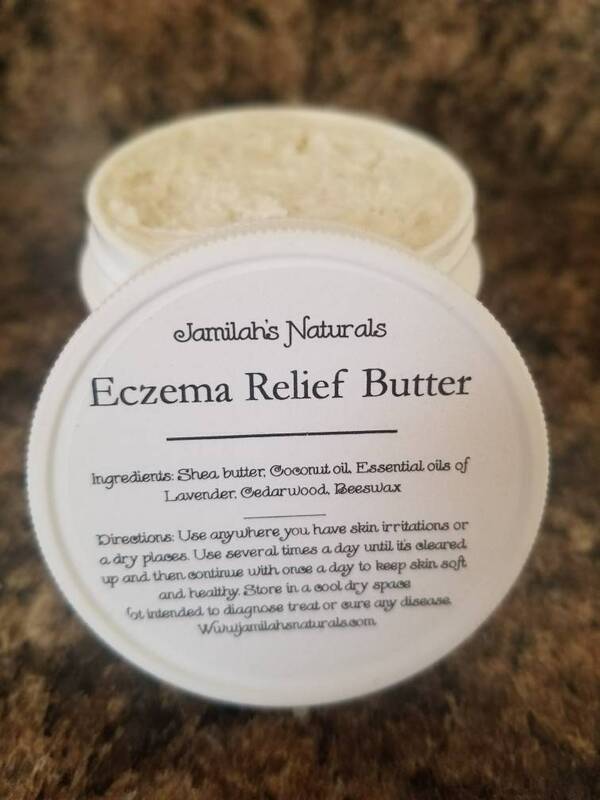 We have tried for years with several prescription steroidal crest to heal an eczema spot on my son's foot. With this product it is finally healing. I would recommend anyone try it. We apply minimum twice a day and as my son has irritation from the flare ups. Thanks for a great product. My daughter has been suffering from "dermatitis" on her scalp for a while. I've tried everything recommended by Dr's and Dermatologist and nothing worked. We've been using this on her scalp and w consistency it has cleared almost all of it up. Thank you. I'd definitely recommend this. A bargain at any price. So soothing and creamy and smells amazing. Thanks for making products that let me feel good about using on my family.